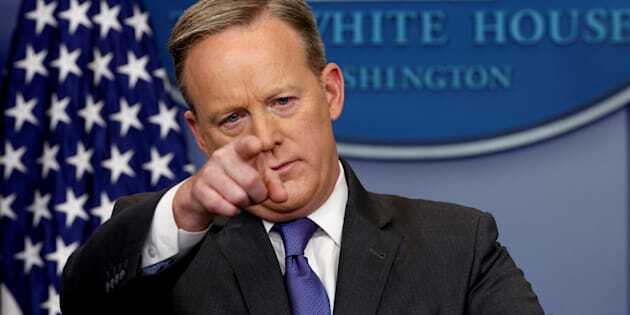 Sean Spicer is a talking point -- period. Is this a cry for help from the White House from the press secretary? Surely not. Everything is fine, after all, and even if it wasn't the dude has his own flak jacket. U.S. President Donald Trump's spokesman on Sunday tweeted his seeming support for the satirical The Onion video, which defined his role in the controversial administration as providing "the American public with robust and clearly articulated misinformation". Even if he's not supporting it, he's clearly willing to take the piss out of himself. His use of 'period!' became one of the defining points of ridicule from his first press briefing. Spicer's first day on the job ended poorly when he declared -- despite overwhelming evidence otherwise -- that Trump's was the "largest audience to ever witness an inauguration, period, both in person and around the globe". This effort spawned the worst phrases of 2017 -- alternative facts -- and spawned a battery of alternative departmental Twitter accounts. It wasn't the last time the press secretary -- who really has a thing for gum and tweeted something that looked a lot like a password -- courted ridicule and controversy. The U.S. Holocaust museum issued a statement critical of Trump and Spicer leaving out Jews of their statements marking the World War II atrocity.